Imaging a place where the dead rest on shelves like books. Each body has a story to tell, a life seen in pictures that only Librarians can read. The dead are called Histories, and the vast realm in which they rest is the Archive. Last summer, Mackenzie Bishop, a Keeper tasked with stopping violent Histories from escaping the Archive, almost lost her life to one. Now, as she started her junior year at Hyde School, she's struggling to get her life back. But moving on isn't easy - not when her dreams are haunted by what happened. She knows the past is past, knows it cannot hurt her, but it feels so real, and when her nightmares begin to creep into her waking hours, she starts to wonder if she's really safe. With stunning prose and a captivating mixture of action, romance and horror, The Unbound delves into a richly imagined world where no choice is easy and love and loss feels like two sides of the same coin. The Archived is definitely the highlight of my January reads. With its cleverly crafted plot, unique world building and fantastic characters, it is such a solid read that I rated it a 5 out of 5 stars and immediately picked up its sequel, The Unbound. Last warning: please read the first book before continuing on with this review. Although it's spoiler free for this book (with spoilers hidden as white text), it will contain details regarding the first book, possibly spoiling it for you. In The Unbound, MacKenzie's summer break is over and not only does she have to deal with starting her junior year at Hyde School, but she still has her role as a Keeper occupying all her spare time. Just when she doesn't think life can get anymore complicated, people from the neighbourhood are disappearing and while there doesn't seem to be any connections, Mac knows that's not entirely true. All of the missing people ran into her shortly before they disappeared. Can Mac uncover the truth before she becomes the prime suspect? Even though the plot is most definitely the stand out of this book for me, that doesn't mean the characters aren't once again fantastic. Mac and Wesley continue to grow and develop as characters. Despite being fully fleshed out and wonderful in The Archived, the pair just continues to mature in the second book and that's something really refreshing to see. The dynamic interactions between Mac and Wesley just come alive from the pages and makes me look forward to every scene that contains them. 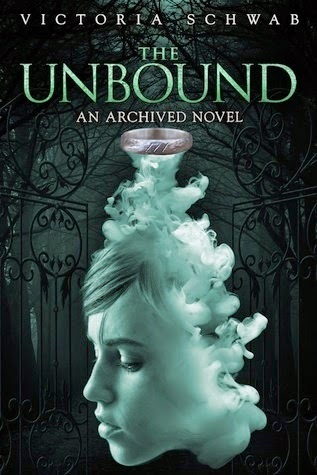 The Unbound is a fantastic sequel to The Archived. This duology has definitely earned their spot on my 2015 favourites shelf. I highly recommend this, and Victoria Schwab in general, to any reader who enjoys YA urban fantasy. They are both awesome! :D I'm still holding out hopes that Hyperion will eventually pick up and publish the third book because I need it... now!!! I haven't read the Archived yet but I've heard so many great things about these books. I'm reading Vicious and A Darker Shade of Magic next month, so hopefully those novels will motivate me to pick up The Archived & Unbound!